The Artist Of The Month for April is Misstigri and all CDO Diamond Club members will get this FREE exclusive tube this month! All members signed up by 10pm PST April 30th 2019 will get this tube + any other tube you want in the store (excludes new releases & exclusives). There is also a matching IB scrap kit from Honored Scraps that matches this tube. 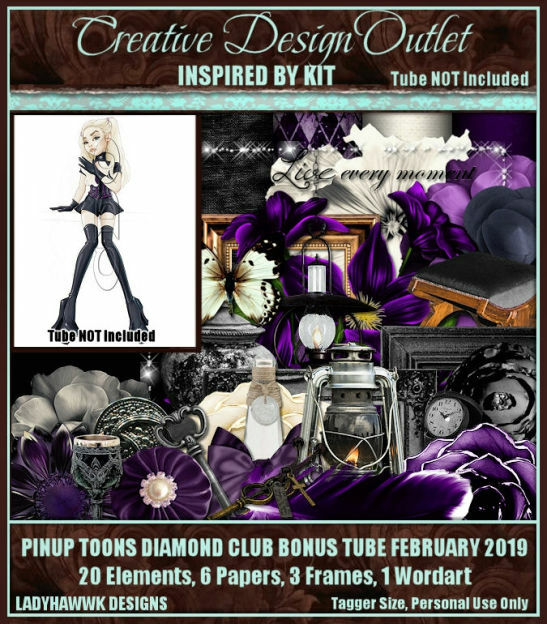 The Artist Of The Month for March is Sybile Art and all CDO Diamond Club members will get this FREE exclusive tube this month! All members signed up by 10pm PST March 31st 2019 will get this tube + any other tube you want in the store (excludes new releases & exclusives). There is also a matching IB scrap kit from Foxy Designz that matches this tube. The Artist Of The Month for October is Andreea Cernestean and all CDO Diamond Club members will get this FREE exclusive tube this month! All members signed up by 10pm PST October 31st 2018 will get this tube + any other tube they want in the store (excludes new releases & exclusives). We have a category in the store for previous AOTM IB kits too! The Artist Of The Month for September is Colourbelle and all CDO Diamond Club members will get this FREE exclusive tube this month! All members signed up by 10pm PST September 30th 2018 will get this tube + any other tube they want in the store (excludes new releases & exclusives). There is also a matching IB scrap kit from Chaos Priestess that matches this tube. She is also our Designer Of The Month so you can get 25% off this kit all month! And we have a category in the store for previous AOTM IB kits too! The Artist Of The Month for May is Sheena Pike and all CDO Diamond Club members will get this FREE exclusive tube from her this month! All members signed up by 10pm PST May 31st 2018 will get this tube + any other tube they want in the store (excludes new releases & exclusives). And we have a new category in the store for previous AOTM IB kits too!